Guy W. Gupton, "HVAC Controls: Operation & Maintenance, 3rd Edition"
Newly updated third edition, this handbook was written to serve as a complete and concise reference for those engaged in the operation and maintenance of automatic control systems serving building heating, ventilating and air conditioning systems. The full range of topics pertinent to the effective operation of all types of HVAC control systems currently in use today are explored, including equipment-to-control interactions, control system set-up and functions, local loop to building automation system interfaces, performance prediction and assessment, operational parameters, and maintenance and testing. 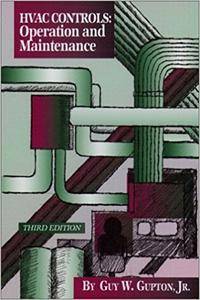 The third edition includes a new chapter covering the installations and procedures required to update an existing pneumatic control system to a hybrid pneumatic and direct digital system by adding DDC signal sensing and control algorithms to existing pneumatic actuators on dampers and valves.